Congratulations Jennifer Hoft Henderson and Suzanne McReynolds! 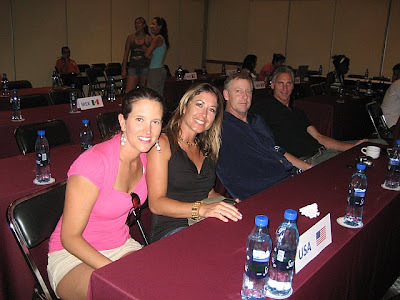 My niece Jennifer Hoft Henderson (left) and Suzanne McReynolds represented the United States at the the Federation Internationale de Volley Ball (FIVB) Tournament last weekend in Mexico. Jennifer has played internationally before but this was by far her biggest tournament to date and she was very excited to be representing the United States. 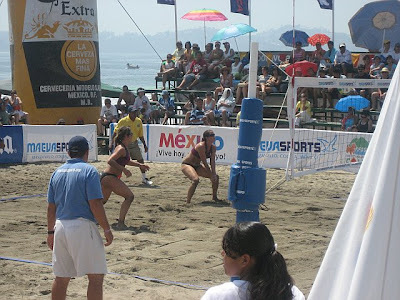 The tournament was played on April 30th though May 4th and was broadcast on Mexico TV. Of course the whole family and her husband Chuck (she is married) were very proud of her for this accomplishment. The tournament had an opening ceremony where all of the teams from at least 13 different countries were paraded into a banquet hall and had their own press desk. 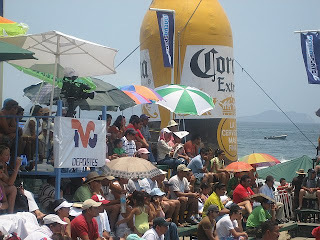 The Corona balloon was making people thirsty on the beach. Jennifer is serving the ball here. Team USA took 7th place in the tournament. The top 8 teams won cash! Here Jen and Suzanne play defense. FYI: Jen passed on to me that like many of today’s athletes she is always looking for sponsors for support. If you know someone who might be interested in sponsoring her, here is her email.